It’s taken me just under a year, but I can now say confidently that I make the best frittata in the world. I know, I know – it’s not like me to make hugely bold claims (cough!) – but the proof of this particular pudding is in making and eating the recipe I’ve set out below. Once you do, you’ll be shouting my praises from your frying pan. Of course, I didn’t set out to become the best frittata maker in the whole world. 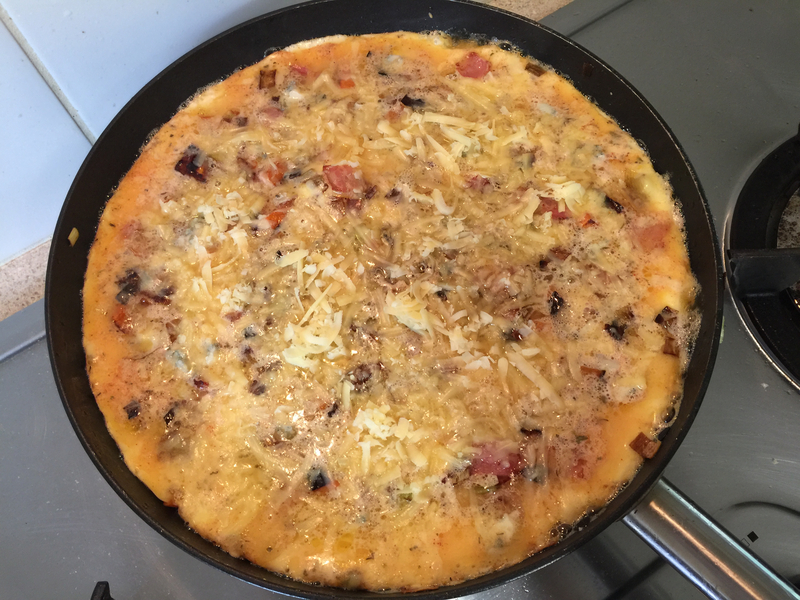 And my first attempts – cheese, ham, tomato yawn, yawn, yawn – were basically nothing more than thick wedges of eggy omelette weighted down by lashings of way too much cheese (yes, I just said that – I feel like I should go wash my mouth out with soap). 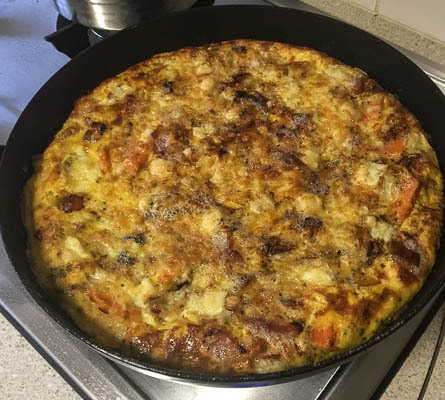 I do make really good omelettes – but contrary to popular opinion, a frittata is not just a big, fat, overweight omelette. At least, not if you do it properly. The first mistake I made was not understanding the difference. 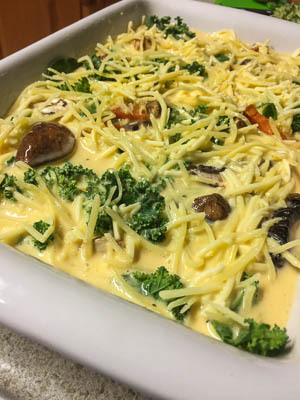 The great thing about this recipe for my best frittata is that you can use any filling you like – but the combinations are what makes it work. Don’t just toss in any old thing. Put together combinations of flavours that are a hit together. Don’t be afraid to try something a little unusual. 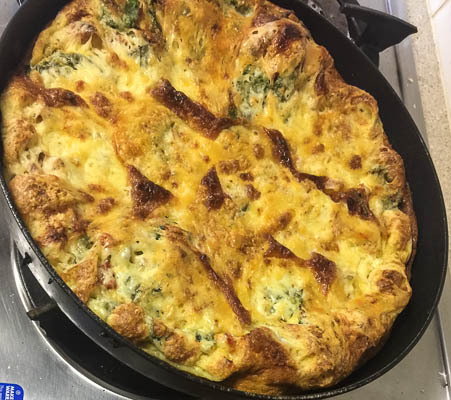 My best frittata was the result of adding a little blue cheese – something I’d never done before, despite how much I love the cheese itself. As with most food, try to combine a sweeter element with a stronger, salty element. Or creamy with crunchy. It’s those foodie clashes that elevate your best frittata to levels of greatness near my own. Throwing some crunch on the top – like some pine nuts or sunflower seeds increases your nutrients and gives you an added layer of flavour. 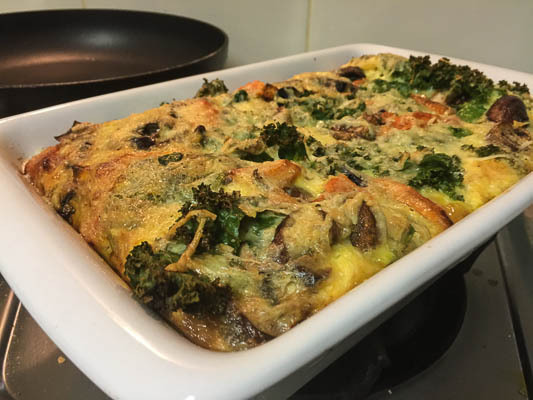 One of the biggest reasons I started out on my frittata career is because I like to eat healthy foods, and my personal dietary requirements mean I have to eat high protein foods in small quantities – which makes frittata a perfect solution. My recipe always contains leek rather than onion, as it has a gentler flavour but is high in fiber and works with pretty much any other filling. Eggs are full of protein and good cholesterol, and the other fillings always contain at least one vegetable and one other protein. Plus cheese of course. I use full fat milk, yogurt and cheese. Before you start yelling – read up a little on the health benefits of full cream over no fat. You’ll be rather shocked. It’s way healthier than any skim version of, well, anything. Crack the eggs into a large bowl. Add milk, yogurt, salt and pepper, paprika, vinegar, ¾ of the grated cheese and any other item that doesn’t require pre-cooking. Use a fork to whisk lightly until just combined and no more – otherwise your frittata will end up bubbly and dry inside. In your deep frying pan, heat a little oil or butter and cook leak and bacon. Set the stove temperature to medium under the pan. Add a little more oil or butter to the pan and pour in the egg mixture. Sprinkle the sweet potato evenly over the egg mixture. Keep on the stove until the edges of the frittata are cooked. Then place the pan under a medium-high grill for 5-10 minutes or until the top part of the frittata is thoroughly cooked and golden. Remove from the grill, take a photo and post it to your favourite social media. You deserve it. Once it’s cooled a little it’s ready for eating heaven! I put slices in the freezer to have for take-to-work breakfast each day – but it’s just as good for a quick easy family dinner or a ladies’ brunch with a crunchy salad. See, this is why it’s the perfect meal: quick and easy to make, can make it out of anything and it suits all purposes! Yes, I’m a genius, I know. Of course, you don’t have to use a pan and half-cook your frittata on the stove top. You can also put your mixture into an oven dish and cook it at a medium temperature (depending on your oven) for about 30 minutes. You’ll know it’s cooked when all the liquid has become solid on top. If you use a bigger backing dish, add extra eggs. The dish in my photo had 14 eggs. You can use pretty much anything you like in a frittata – just remember not to over-fill it. You need a lot more egg than filling otherwise it’ll fall apart once you slice it. Which means you just made a really big, messy – and let’s face it, ugly – omelette. Basically, just use combinations of your favourite food – leftovers are great. Always try to add a different cheese and if you like to live dangerously, sprinkle a little parmesan cheese on top before you put it under the grill. Please let me know how you go with your frittata. I’d love to hear about your success and what you used for filling. I’m always on the lookout for more interesting ideas. Enjoy, and – you’re welcome!